The 9th European Meeting on Visual Physiological Optics (VPO2018) was held August 29–31, 2018, in Athens, Greece. 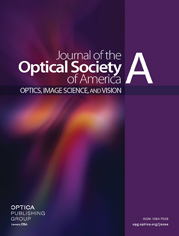 This issue of the Journal of the Optical Society of America A (JOSA A) is a dedicated feature, including numerous articles that span a large range of visual optics related topics, ranging from geometrical optics to visual psychophysics and from optical metrology to ophthalmic diagnostic technologies. The next VPO meeting will be held August 2020 in Cambridge, UK.